"Junior High School" redirects here. For the senior half of secondary school, see high school. A middle school (also known as intermediate school or junior high school) is an educational stage which exists in some countries, providing education between primary school and secondary school. The concept, regulation and classification of middle schools, as well as the ages covered, vary between, and sometimes within, countries. In Afghanistan, middle school consists of the primary school grades 5,6, and 7 and the secondary school grade 8. In Albania, middle school is included in the primary education which lasts 9 years and attendance is mandatory. In Algeria, a middle school includes 4 grades; 6, 7, 8 and 9 consisting of students from ages 11 to 14 or 12 to 15. The ciclo básico of secondary education (ages 12–16) is roughly equivalent to middle school. As an alternative to the middle school model, some secondary schools divided their grades into "junior high school" (years 7, 8, 9 and 10) and "senior high school" (years 11 and 12). Some have three levels, "junior" (years 7 and 8), "intermediate" (years 9 and 10), and "senior" (years 11 and 12). The first middle school established in Australia was The Armidale School, in Armidale (approximately 370 km (230 mi) north of Sydney, 360 km (220 mi) SSW of Brisbane and approximately 140 km (87 mi) due west of Coffs Harbour on the coast). Other schools have since followed this trend. The Northern Territory has introduced a three tier system featuring Middle Schools for years 7–9 (approximate age 13–15) and high school year 10–12 (approximate age 16–18). Many schools across Queensland have introduced a Middle School tier within their schools. The middle schools cover years 5 to 8. In Bangladesh, middle school is not separated like other countries. Generally schools are from class 1 to class 10. It means lower primary (1–5), upper primary (6–10). From class 6–8 is thought as middle school. Grades 1,2,3,4 and 5 are said to be primary school while all the classes from 6 to 9 are considered high school (as middle school and high school are not considered separate) while 10–12 is called college. There aren't middle schools in Bolivia since 1994. Students aged 11–15 attend the last years of elementary education or the first years of secondary education. In Bosnia and Herzegovina "middle school" refers to educational institutions for ages between 14 and 18, and lasts 3–4 years, following elementary school (which lasts 8 or 9 years). Gymnasiums are the most prestigious type of "middle" school. In Brazil, middle school is a mandatory stage that precedes High School (Ensino Médio) called "Ensino Fundamental II" consisting of grades 6 to 9, ages 11 to 14. In Canada, the terms "Middle School" and "Junior High School" are both used, depending on which grades the school caters to. Junior high schools tend to include only grades 7, 8, and sometimes 9 (some older schools with the name 'carved in concrete' still use "Junior High" as part of their name, although grade nine is now missing), whereas middle schools are usually grades 6–8 or only grades 7–8 or 6–7 (i.e. around ages 11–14), varying from area to area and also according to population vs. building capacity. Another common model is grades 5–8. Alberta, Nova Scotia, Newfoundland, and Prince Edward Island junior high schools (the term "Middle School" is not commonly used) include only grades 7–9, with the first year of high school traditionally being grade 10. In some places students go from elementary school to secondary school, meaning the elementary school covers to the end of Grade 8. In Ontario, the term "Middle School" and "Senior Public School" (sometimes just grades 7 and 8) are used, with the latter being used particularly in the Old Toronto and Scarborough sections of Toronto plus in Mississauga, Brampton and Kitchener-Waterloo. In many smaller Ontario cities and in some parts of larger cities, most elementary schools serve junior kindergarten to grade 8 meaning there are no separate Middle Schools buildings, while in some cities (such as Hamilton) specific schools do serve the intermediate grades (i.e. Grades 6–8 or Grades 7–8) but are still called "Elementary" or "Public" schools with no recognition of the grades they serve in their name. Quebec uses a grade system that is different from those of the other provinces. In Quebec there is no Middle school section. The Secondary level has five grades starting after Elementary Grade 6. These are called Secondary I to Secondary V.
There aren't middle schools in Chile. Students aged 11 to 16 attend the last years of educación básica (basic education, until age 14) or the first years of educación media (middle education, equivalent to middle and high school). In the People's Republic of China, middle school has two stages, junior stage (grades 7–9, some places are grades 6–9) and senior stage (grades 10–12). The junior stage education is the last 3 years of 9-year-compulsory education for all young citizens; while the senior stage education is optional but considered as a critical preparation for college education. Some middle schools have both stages while some have either of them. The admissions for most students to enroll in senior middle schools from junior stage are on the basis of the scores that they get in "Senior Middle School Entrance Exam",[note 1] which are held by local governments. Other students may bypass the exam, based on their distinctive talents, like athletics, or excellent daily performance in junior stage. Secondary education is divided into basic secondary (grades 6 to 9) and mid-secondary (grades 10 and 11). The students in basic secondary, roughly equivalent to middle school, are 11 or 12 to 15 or 16 years old. In Croatia "middle school" refers to educational institutions for ages between 14 and 18, and lasts 3–5 years, following elementary school (which lasts 8 years). Gymnasiums are the most prestigious type of "middle" school. Secundaria básica (basic secondary, seventh through ninth grades) is the approximate equivalent of middle school in Cuba. In the Czech Republic after completing the nine-year elementary school (compulsory school attendance) a student may apply for high school or grammar school. Students have the opportunity to enroll in high school from Grade 5 or (less commonly) Grade 7 of elementary school, spending eight or six years respectively at high school that otherwise takes four years. Thus they can spend five years in elementary school, followed by eight in high school. The first four years of eight-year study program at high school are comparable with junior high school. Gymnasium focuses on a more advanced academic approach to education. All other types of high schools except gymnasiums and conservatories (e.g. lyceums) accept only students that finished Grade 9. The 4th and last level of educación general básica (ages 12–14) is roughly equivalent to middle school. In Egypt, middle school precedes high school. It is called the preparatory stage and consists of three phases: first preparatory in which students study more subjects than primary with different branches. For instance, algebra and geometry are taught instead of "mathematics." In the second preparatory phase, students study science, geography, the history of Egypt starting with pharaonic history, including Coptic history, Islamic history, and concluding with modern history. The students are taught two languages, Arabic and English. Middle school (preparatory stage) lasts for three years. In France, the equivalent period to middle school is collège, which lasts four years from the Sixième (sixth, the equivalent of the Canadian and American Grade 6) to the Troisième (third, the equivalent of the Canadian and American Grade 9), accommodating pupils aged between 11 and 15. Upon completion of the latter, students are awarded a Brevet des collèges if they obtain a certain amount of points on a series of tests in various subjects (French, history / geography, mathematics, science / physics / chemistry), but also on a series of skills completed during the last year and on oral examinations (e.g., about cross-subjects themes they work on the latest years, the fourth year of collège). They can then enter high school (called lycée), which lasts three years from the Seconde to the Terminale until the baccalauréat, and during which they can choose a general or a professional field of study. In Georgia,the equivalent period to middle school covers ages 12 to 15, from the 7th grade to the 10th and guarantees basic educational degree certificate. There are four middle schools in Gibraltar, following the English model of middle-deemed-primary schools accommodating pupils aged between 9 and 12 (National Curriculum Years 4 to 7). The schools were opened in 1972 when the government introduced comprehensive education in the country. In Greece, the equivalent period to middle school is called Gymnasium (Γυμνάσιο), which caters to children between the ages 13 and 15, i.e. 7th, 8th and 9th grade. In some institutions, providing education for 5th to 10th is known as secondary school. In Indonesia, middle school (Indonesian: Sekolah Menengah Pertama, SMP) covers ages 12 to 14 or class 7 to class 9. Iran calls Middle School Secondary School, which caters to children between the ages 12 and 15, i.e. 7th, 8th and 9th grade. In most of the cities in Israel, middle school (Hebrew: חטיבת ביניים, Khativat Beynaiym) covers ages 12 to 15. From the 7th grade to the 9th. In Italy the equivalent is the "scuola secondaria di primo grado" formerly and commonly called "middle lower school" (Scuola Media Inferiore), often shortened to "middle school" (Scuola Media). When the "Scuola secondaria di secondo grado", the equivalent of high school, was formerly called "middle higher school" (Scuola Media Superiore), commonly called "Superiori". The Middle School lasts three years from the student age of 11 to age 14. Since 2009, after "Gelmini reform", the middle school was renamed "Scuola secondaria di primo grado" ("junior secondary school"). Middle school in Jamaica is called Junior High School. It is from grade 7–9 but this idea is becoming rare now so these grades are considered lower secondary. Junior high schools (中学校 chūgakkō) are for children aged twelve through fifteen years old. In Kosovo "middle school" refers to educational institutions for ages between 14 and 18, and lasts 3–4 years, following elementary school (which lasts 8 or 9 years). Gymnasiums are the most prestigious type of "middle" school. In Kuwait, middle school is from grade 6–9 and from age 11–14. In Lebanon, middle school or intermediate school consists of grades 7, 8, and 9. At the end of 9th grade, the student is given the National diploma examination. In North Macedonia "middle school" refers to educational institutions for ages between 14 and 18, and lasts 3–4 years, following elementary school (which lasts 8 or 9 years). Gymnasiums are the most prestigious type of "middle" school. In Malaysia, the middle school equivalent is called lower secondary school which consists of students from age 13 to 15 (Form 1-3). [note 2] Usually, these lower secondary schools are combined with upper secondary schools to form a single secondary school which is also known as high school. Students at the end of their lower secondary studies are required to sit for an examination called PT3 (Form 3. 7 subjects for non-Muslim students and 8 subjects for Muslim students) in order to determine their field of studies for upper secondary (Form 4-5). In Mexico, the middle school system is called Secundaria and usually comprises three years, grades 7–9 (ages: 7: 12–13, 8: 13–14, 9: 14–15). It is completed after Primaria (Elementary School, up to grade 6: ages 6–12) and before Preparatoria/Bachillerato (High School, grades 10–12 ages 15–18). In Montenegro "middle school" refers to educational institutions for ages between 14 and 18, and lasts 3–4 years, following elementary school (which lasts 8 or 9 years). Gymnasiums are the most prestigious type of "middle" school. In New Zealand middle schools are known as intermediate schools. They generally cover years 7 and 8 (formerly known as Forms 1 to 2). Students are generally aged between 10 and 13. There are full primary schools which also contain year 7 and 8 with students continuing to high school at year 9 (formerly known as Form 3). Some high schools also include years 7 and 8. After 2000 there was an increased interest in middle schooling (for years 7–10) with at least seven schools offering education to this age group opening around the country in Auckland, Cambridge, Hamilton, Christchurch and Upper Hutt. In Pakistan, middle school (Class 1 – 8) is a combination of primary (Class 1 – 5) and middle (Class 6 – 8). Since the implementation of the K–12 education system, middle school education in the Philippines is called Junior High School. It lasts for 4 years from Grades 7 to 10 for students age 12 to 16. Some schools, such as Miriam College in Loyola Heights as well as Lourdes School of Quezon City in Sta. Mesa Heights, have their Middle Schools from Grades 6 to 8. It is preceded by a 6-year elementary school and followed by a 2-year senior high school program. Before that, there were no official middle school programs implemented and the equivalent years was simply called High School which ranged from First Year to Fourth Year. Middle school in Poland, called gimnazjum, was first introduced in 1932. The education was intended for pupils of at least 12 years of age and lasted four years. Middle schools were part of the educational system until the reform of 1947, except during World War II. The middle schools were reinstated in Poland in 1999 now lasting three years after six years of primary school. Pupils entering gimnazjum are usually 13 years old. Middle school is compulsory for all students, and it is also the final stage of mandatory education. In the final year students take a standardized test to evaluate their academic skills. Higher scorers in the test are allowed first pick of school if they want to continue their education, which is encouraged. Starting with the school year 2017/18, middle schools are scheduled to be disbanded and primary schools to be extended to lasting eight years, as it was before 1999. In Portugal, the middle school is known as 2nd and 3rd cycles of basic education (2º e 3º ciclos do ensino básico). It comprises the 5th till 9th year of compulsory education, for children between ten and fifteen years old. After the education reform of 1986, the former preparatory school (escola preparatória) and the first three years of the liceu, became part of basic education (educação básica). Middle school in Romania, or gymnasium (gimnaziu), includes grades 5 to 8 and the students usually share the building with the students of primary school but in different wings/floors. Primary school lessons are taught by a handful of teachers: most are covered by one of them, and more specific areas such as foreign languages, religion or gym may have dedicated teachers. The transition to middle school changes that to a one teacher per course model where the students usually remain in the same classroom while the teachers rotate between courses. At the end of the eighth grade (usually corresponding to age 14 or 15), students take a written exam that counts for 80% (before, it used to be 50%) of the average needed to enroll in high school. Students then go to high school or vocational school, depending on their final grade. Schooling is compulsory until the tenth grade (which corresponds with the age of 16 or 17).The education process is done in numbered semesters, the first semester lasting 19 weeks between September and February and the second semester lasting 16 weeks between February and June. Middle school in Russia covers grades 5 to 9, and is a natural continuation of primary school activities (almost always they are in the same building with both primary and high school, usually located in different wings/floors). Primary school lessons are taught by a handful of teachers: most are covered by one of them, and more specific areas such as English or gym may have dedicated teachers. The transition to middle school changes that to a one teacher per course model, where teachers stay in their classrooms and pupils change rooms during breaks. Examples of courses include mathematics (split from grade 7 into algebra, geometry and physics), visual arts, Russian language, foreign language, history, literature, geography, biology, computer science, chemistry (from grade 8), social theory (in grade 9). The education process is done in numbered quarters, with the first quarter covering September and October, second quarter November and December, third quarter going from mid January to mid March, fourth quarter covering April and May. There are one week long holidays between quarters 1 and 2 as well as 3 and 4, somewhat longer holidays between quarters 2 and 3 to allow for New Year festivities, and a three-month break between the years. At the end of middle school most people stay in school for two more years and get a certificate allowing them to pursue university, but some switch to vocational-technical schools. In Serbia "middle school" refers to the second half of primary (elementary) education for ages between 11 and 15 and lasts 4 years (grades 5 through 8), following the first half of primary school (grades 1 through 5, ages 7 to 11). Middle schools are not considered separate from elementary school in Serbia but rather an extension of it and are usually held in the same school building but in opposite shifts. Middle school is the transitional period from primary education to secondary education (high school) where children are transitioned from having very generalized subjects and a main teacher for most of them with only a handful of other teachers for specialized subjects like English, music and gym to a more serious curriculum with a course load that better mirrors high school. Middle school is the first time children have separate teachers for each subject and are introduced to courses like chemistry, biology, a second foreign language and physics. Both elementary and middle school are compulsory in Serbia, after which almost all students take the state-issued universal entrance exam to qualify for high school, be it a Gymnasium, a specialized high school for subjects like Economics or Medicine, or a Vocational school (trade school). 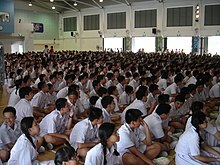 In Singapore, middle school is usually referred to as secondary school. Students start secondary school after completing primary school at the age of 13, and to 16 (four years if they are taking the Special, Express or Normal Technical courses), or 17 (five years if they are taking the Normal Academic courses). Students from the Special and Express courses take the GCE 'O' Levels after four years at the end of secondary education, and students from the Normal (Academic and Technical) courses take the GCE 'N' Level examinations after four years, and the Normal Academic students has the option to continue for the 'O' Levels. Selected excelling students also have the option to change classes which then affect the years they study. After completing secondary school, students move on to pre-tertiary education (i.e. in institutes such as junior colleges, polytechnics, ITE). In Slovenia "middle school" refers to educational institutions for ages between 14 and 18, and lasts 3–4 years, following elementary school (which lasts 8 or 9 years). Gymnasiums are the most prestigious type of "middle" school. In Somalia, middle school identified as intermediate school is the four years between secondary school and primary school. Pupils start middle school from form as referred to in Somalia or year 5 and finish it at year 8. Students start middle school from the age of 11 and finish it when they are 14–15. Subjects, which middle school pupils take are: Somali, Arabic, English, Religion, Science, Geography, History, Math, Textiles, Art and Design, Physical Education (PE) (Football) and sometimes Music. In some middle schools, it is obligatory to study Italian. In South Korea, a middle school is called a jung hakgyo (Hangul: 중학교; Hanja: 中學校) which includes grades 7 through 9 (referred to as: middle school 1st–3rd grades; approx. age 13–15). In Spain, education is compulsory for children between 6 and 16 years. Basic education is divided into Educación Primaria (first grade through sixth grade), which is the Spanish equivalent of elementary school; and Educación Secundaria Obligatoria or ESO (seventh through tenth grade), roughly the Spanish equivalent of middle school and (partially) high school. The usual ages in ESO are 12 to 15 years old, but they can range between 11 and 16 depending on the birth date (a student who was born late in the year may start ESO at 11 if he or she will turn 12 before January 1, and a student who was born early in the year may finish ESO after turning 16). After ESO, students can continue their pre-university education attending to Bachillerato (eleventh and twelfth grade) or choose a Ciclo de Formación Profesional (an improved type of vocational school). Junior high schools (three years from 7th to 9th grade) in Taiwan were originally called "primary middle school". [note 3] However, in August 1968, they were renamed "nationals' middle school"[note 4] often translated "junior high") when they became free of charge and compulsory. Private middle school nowadays are still called "primary middle school". Taiwanese students older than twelve normally attend junior high school. Accompanied with the switch from junior high to middle school was the cancellation of entrance examination needed to enter middle school. In England and Wales, local education authorities introduced middle schools in the 1960s and 1970s. The notion of Middle Schools was mooted by the Plowden Report of 1967 which proposed a change to a three-tier model including First schools for children aged between 4 and 7, Middle Schools for 7–11 year-olds, and then upper or high schools for 11–16 year-olds. Some authorities introduced Middle Schools for ideological reasons, in line with the report, while others did so for more pragmatic reasons relating to the raising of the school leaving age in compulsory education to 16, or to introduce a comprehensive system. Around 2000 middle and combined schools were in place in the early 1980s. However, that number began to fall in the later 1980s with the introduction of the National Curriculum. The new curriculum's splits in Key Stages at age 11 encouraged the majority of local education authorities to return to a two-tier system of Primary (sometimes split into Infant schools and Junior schools) and Secondary schools. There are now fewer than 150 middle schools still operational in the United Kingdom, meaning that approximately 90% of middle schools have closed or reverted to primary school status since 1980. The system of 8–12 middle schools has fallen into complete disuse. Under current legislation, all middle schools must be deemed either primary or secondary. Thus, schools which have more primary year groups than KS3 or KS4 are termed deemed primaries or middles-deemed-primaries, while those with more secondary-aged pupils, or with pupils in Y11 are termed deemed secondaries or middles-deemed-secondaries. For statistical purposes, such schools are often included under primary and secondary categories "as deemed". Notably, most schools also follow teaching patterns in line with their deemed status, with most deemed-primary schools offering a primary-style curriculum taught by one class teacher, and most deemed-secondary schools adopting a more specialist-centred approach. Legally all-through schools are also considered middle schools (deemed secondary), although they are rarely referred to as such. Some middle schools still exist in various areas of England. They are supported by the National Middle Schools' Forum. See List of middle schools in England. In Scotland, a similar system to the English one was trialled in Grangemouth middle schools, Falkirk between 1975 and 1987. The label of junior high school is used for some through schools in Orkney and Shetland which cater for pupils from 5 up to the age of 14, at which point they transfer to a nearby secondary school. Middle schools in the United States usually cover grades 5–6, 5–8, 6–8, or 7–8. Historically, local public control (and private alternatives) have allowed for some variation in the organization of schools. Elementary school includes kindergarten through to sixth grade, or kindergarten through to fifth grade, i.e., up to age 12, but some elementary schools have four or eight grades, i.e., up to ages 10 or 14 (also known as the intermediate grades). Basic subjects are taught and pupils often remain in one or two classrooms throughout the school day, except for physical education, library, music, and art classes. In 2001, there were about 3.6 million children in each grade in the United States. "Middle schools" and "junior high schools" are schools that span grades 5 or 6 to 8 and 7 to 8, respectively, but junior high schools spanning grades 7 to 9 were common until the 1980s. The range defined by either is often based on demographic factors, such as an increase or decrease in the relative numbers of younger or older students, with the aim of maintaining stable school populations. At this time, pupils are given more independence, moving to different classrooms for different subjects, which includes math, social studies, science, and language arts. Also, pupils are able to choose some of their class subjects (electives). Usually, starting in ninth or tenth grade, grades become part of a pupil's official transcript. In the U.S., children within this grade-range are sometimes referred to as "junior highers". The “junior high school” concept was introduced in 1909, in Columbus, Ohio. Junior high schools were created for "bridging the gap between the elementary and the high school", an emphasis credited to Charles W. Eliot. In the late 19th century and early 20th century, most American elementary schools had grades 1 through 8, and this organization still exists, where some concepts of middle school organization have been adapted to the intermediate grades. As time passed, the junior high school concept increased quickly as new school districts proliferated, or systems modernized buildings and curricula. This expansion continued through the 1960s. Jon Wiles, author of Developing Successful K–8 Schools: A Principal's Guide, said that "[a] major problem" for the original model was "the inclusion of the ninth grade", because of the lack of instructional flexibility, due to the requirement of having to earn high school credits in the ninth grade—and that "the fully adolescent ninth grader in junior high school did not seem to belong with the students experiencing the onset of puberty". The new middle school model began to appear in the mid-1960s. Wiles said, "At first, it was difficult to determine the difference between a junior high school and a middle school, but as the middle school became established, the differences became more pronounced [...]." The faculty is organised into academic departments that operate more or less independently of one another. The middle school format has now replaced the junior high format by a ratio of about ten to one in the United States, but at least two school districts had incorporated both systems in 2010. In Uruguay, the public middle school consists of two stages, one mandatory called "Basic Cycle" or "First Cycle". This consists of three years, ages 12–13, 13–14 and 14–15, and one optional called "Second Cycle", ages 15–16, 16–17 and 17–18. The Second Cycle is divided into 4 options in the 5th grade: "Human Sciences", "Biology", "Scientific" and "Arts", and 7 options in the 6th and last grade: "Law" or "Economy" (if Human Sciences course taken in 5th), "Medicine" or "Agronomy" (if Biological course taken in 5th), "Architecture" or "Engineering" (if Scientific course taken in 5th) and "Arts" (if Arts course taken in 5th). Both these stages are commonly known as "Liceo" (Spanish for "high school"). Middle school starts at grade 7 and ends at grade 9. In Venezuela, public middle schools have a different Spanish name than private schools. [note 5] The school system includes a preparatory year before first grade, so nominal grade levels are offset when compared to other countries (except those countries who have mandatory pre-school). Middle schools (educación media general, ages 12–15) are from 7th grade (equivalent to 8th grade US) to 11th grade, which is equivalent to 12th grade. In some institutions called "Technical Schools" there is an extra grade, for those who want to graduate as "Middle technician" in a certain area. This education would allow them to be hired at a higher level, or get introduced more easily into a college career. There is a "college test" from main universities of the country. Their score on this test might allow them to more quickly obtain a spot within an institution. Students with high qualifications during the high school, have more chances to have the spot. Secondary school, or Junior High school, includes grade 6 to 9. After finishing grade 9, students have to take the graduating test nationally, which includes Mathematics, Literature and English. The maximum score for each test is 10, with the first two subjects (called the Core Subjects) multiplied by two for a total possible score of 50. Reward points from the vocational course; spanning from 1.0 to 2.0 according to the students' record could also be added to the final score. Some public schools use the graduating exam's score and student's transcripts to make their decision. Many other public and private schools require students who apply for those schools to take their entrance exams. The administration team would review the student's transcripts and his or her exam to decide whether that student is qualified for their requirement or not. ^ Commonly referred as "Zhong Kao" (Simplified Chinese: 中考). ^ "Liceo"; private schools are called "Colegio"
^ "Shake-up puts Year 7s in high school". WA Today. ^ "A SHORT HISTORY of THE ARMIDALE SCHOOL" (PDF). The Armidale School. Archived from the original (PDF) on 2013-04-08. Retrieved 2014-01-16. ^ "About Middle Years". Middle Years – Northern Territory of Australia. Northern Territory Government. 200. Archived from the original on 2008-02-23. Retrieved 2008-02-01. ^ "Ley de Reforma Educativa. Ley Nº 1565/1994 - OEI" (PDF). OEI. ^ "Definition of junior high school". Retrieved June 12, 2007. Archived 2009-10-31. ^ "Les niveaux et les établissements d'enseignement – Ministère de l'éducation nationale" (in French). Education.gouv.fr. Retrieved 2014-01-16. ^ "Georgian educational system". Retrieved 2018-09-14. ^ "Schools Gibraltar | Colleges Gibraltar". Retrieved 2009-01-09. ^ a b c Amaidi. "Indian Education System" (PDF). Archived from the original (PDF) on 17 June 2012. Retrieved 5 May 2012. ^ Mehrabi, Masoud. "Iran Chamber Society: Education in Iran: The Iranian Educational System". Retrieved 2014-10-17. ^ "Schools / Homepage - Te Kete Ipurangi (TKI)". ^ Romania, Ministry of National Education and Research (2014). "Changes in Education (Romanian version)". Education (No english version). ^ "Список предметов, изучаемых в начальной, средней и старшей школе". ^ "Учебные четверти и каникулы". ^ Ministry of Education Science & Technology. "Education System". Archived from the original on 17 May 2012. Retrieved 5 May 2012. ^ Government Information Office. "Taiwan's Educational Development and Present Situation". Archived from the original on 31 July 2012. Retrieved 5 May 2012. ^ Central Advisory Council for Education (England) (1967). "Volume 1 Chapter 10 The Ages and Stages of Primary Education". Children and their Primary Schools. Her Majesty's Stationery Office. Archived from the original on 2010-04-04. Retrieved 2008-02-01. ^ a b "Middle schools decline due to haphazard development". Times Educational Supplement. 1981-11-13. p. 9. ^ Andrew, Herbert; Department of Education and Science (1965-07-12). "Main forms of comprehensive organisation". Circular 10/65: The Organisation of Secondary Education. HMSO. Archived from the original on 2007-09-28. Retrieved 2009-04-18. ^ "Education: End of the Middle Way?". BBC News. 1998-06-28. Retrieved 2008-02-01. ^ "UK Middle Schools". Sites.google.com. Retrieved 2016-01-11. ^ "The Education (Middle School) (England) Regulations 2002". Statutory Instrument 2002 No. 1983. Her Majesty's Stationery Office. 2002. Retrieved 2008-02-01. ^ Meldrum, James (1976). Three-tier Education in Grangemouth. ^ "Digest of Education Statistics, 2001" (PDF). Retrieved 2010-04-14. ^ junior high school. encarta.msn.com. Archived from the original on October 31, 2009. Retrieved July 24, 2007. The major difference between a middle school and a junior high lies in the philosophy. The middle school philosophy focuses on the student where the junior high focus is more on the content. CS1 maint: BOT: original-url status unknown (link) 2009-10-31. ^ Gillham, Isabel. "Self-concept and Reading". The Reading Teacher 21.3 (1967): 270–273. ^ "First Junior High School in the United States". OhioHistoryCentral.org. Ohio Historical Society. Retrieved 2014-08-19. ^ "Junior high plan outlined", The Dallas Morning News, September 22, 1929, section 1, page 9. ^ a b Wiles, John, ed. (June 10, 2009). Developing Successful K–8 Schools: A Principal's Guide. Corwin Press. p. 3. ISBN 1412966175. "Why Middle Level Schools Are KEY to Young Adolescent Success" Westerville, OH: NMSA, 2003. Look up junior high school in Wiktionary, the free dictionary. Wikimedia Commons has media related to Middle schools. Association for Middle Level Education formerly National Middle School Associationl.